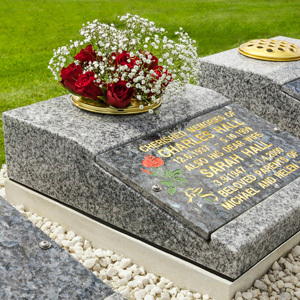 These are traditional granite memorials, in a choice of colour and lettering. There is a special part of the garden where these are located, quiet and private. Up to 2 inscriptions can be engraved onto these memorials. They usually come with a flower vase, but for those wishing a more maintenance-free option, the vase can be omitted. Photoplaques or emblems can be added to the stone if required. 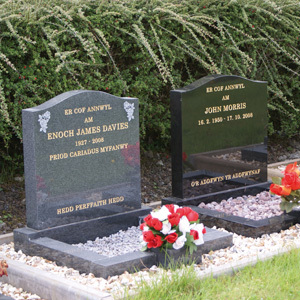 These are elegant granite memorials, again in a choice of granite or lettering colours. There are a range of styles and designs to choose from, and any style can be amended to create a memorial unique to your loved one. The brochure can be just a starting point as any emblem or design can be added to create your chosen memorial. We also offer a choice of granite chippings to add to the stone to make it easier to keep in immaculate order, but you can have just soil instead if you would prefer to plant instead. However, a word of warning – rabbits can do lots of damage to nice, fresh flowers! Vase blocks are smaller, granite memorials but are also inscribed as required. There are a choice of colours and there is a flower container in the top of the vase. There are 2 locations for these vases. One set of vases can be found at the end of the fish pond, in front of the Book Chapel, and there is no provision for ashes in this location. The other location is in a shrub bed, and here we can inter ashes if required. This is our newest memorial option. The barbican is the central feature in our Healing Garden and is created from Honeycomb-coloured granite. On this Barbican are the tropical brown plaques which can be inscribed with the wording of your choice. A range of emblems can be added for a small cost. Also in this area are granite benches and planters for dedication. A gently flowing water feature sits in the corner giving a feeling of peace and quiet.